Flip Out Mama: Jumbies Review and GIVEAWAY! Okay, guys, usually I do not get stuffed animals for the boys. I know all moms have a love/hate relationship with stuffed animals. Where in the hell do they all come from? Why are they so cute? What about them makes our children need 45, 349 of them on their bed? Sigh. 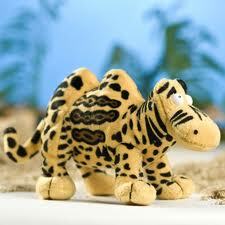 But, today, I'm going to show you some adorable plush toys that made me re-think my stuffed animal ban. Do you see this guy? This is Darwin, and he is a monkey/duck. Isn't he adorable (and weird)?? What is a Jumbie, you ask? Jumbies came about when the storks of the world, who were horribly overworked and stressed from delivering all the baby animals, had a crazy accident one day and all crashed into each other! It was a terrible mess, but luckily all the storks and baby animals were okay.. Well sort of.. The animals were fine, except that they were, well.. jumbled! Zebras and Elephants were now merged into Zelephants, everything was so crazy! But, the sweet little Jumbies had no where to go, so the storks took them all to the beautiful island of Jumbieland. But they still needed people to take care of them, and that's where kids come in. The storks bring Jumbies to kids everywhere so the kids can help take care of them! What a cute story! And what cute little guys these Jumbies are! What Mama Thinks: These little guys are adorable! I love that they have their own little backstory. Tater really liked them too, especially after we read about them and he knew it was his responsibility to help his new little friends. They have, of couse, taken precedence over all the other animals at bedtime and now sleep right beside him.I have decided to make an exception for Jumbies, and they are now allowed to live here. I mean come on, they need kids to take care of them, right?! Do your babies need some Jumbies to take care of? You Can Win Them Some! One lucky Flip Out Mama reader will recieve two Jumbies, thanks to the sweeties at Jumbies! Contest will end on 11/10/2010 at approx 9pm. Winner will be chosen via random.org and will have 48 hours to respond to notification email or an alternate winner will be chosen. Open to US residents only please. I am not responsible for products that are lost, damaged or otherwise not received. It is the responsibility of the company to ship to the winner. I like Darwin the Duckey. I like Darwin and Leopold. 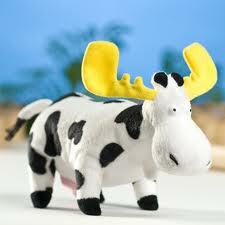 They are all so cute, but my fave is the Moosecow since I live in moose country! Mandatory Entry: I visited Jumbies and I like Darwin, the Duckey, best! Extra Entry: I "liked" Jumbies on Facebook. Extra Entry: I "like" you on Facebook. Oh my goodness.. how stinkin' cute are these little critters?! My fav is the zelephant. My favorite Jumbie is the Darwin. 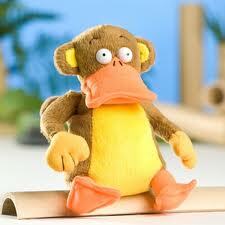 Who wouldn't love a monkey duck?? Our favorite Jumbies is Bunker the Dingbat. I am following Jumbies via Twitter as jlsc123. The Mooscow is my favorite. My favorite is Leopold, Leopard & Hornbill Bird. Thanks! It's hard to choose but I think I like Yuri the Moosecow the best. I like Flip Out Mama over on Facebook for entry #1. I like Flip Out Mama over on Facebook for entry #2. I like Jumbies over on Facebook for entry #1. I like Jumbies over on Facebook for entry #2. I like corky the pigbit. Blabbit is my favorite Jumbie. I follow Jumbies on Twitter (x1). I follow Jumbies on Twitter (mail4rosey). I like Jumbies on Facebook (Sarah Smile). I "like" Jumbies on Facebook!! !